Despite being hot here in Valencia most of the year one thing which has signified the start of summer and the need to refresh oneself is the appearance of Gazpacho on almost every menu. Made well it is truly one of the most satisfying things one can eat in the heat. Served ice-cold and filled with the season’s finest tomatoes, peppers and cucumbers; those adverse to ‘cold soup’ need to experience the real thing. 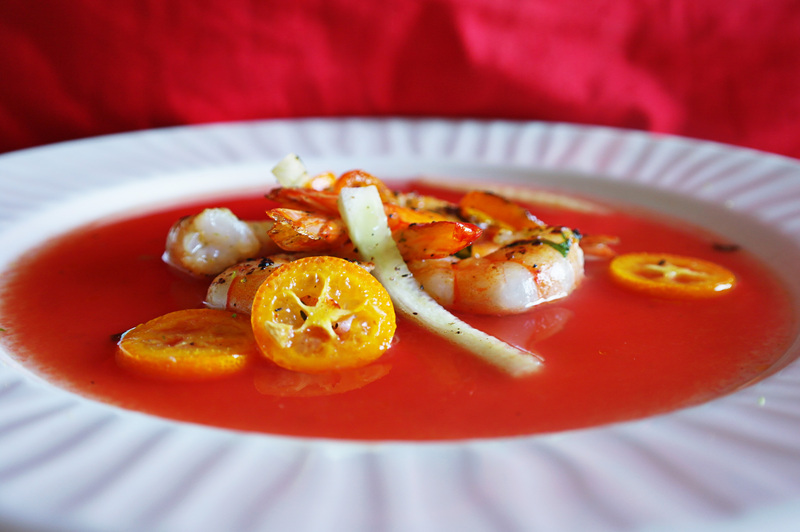 The idea for watermelon gazpacho came from a meal in Havana, in the well-established king of tourist restaurants – La Guarida. Having thought it was a very original dish and a welcome change from the never-ending mountains of rice and beans I was quite surprised to find not only was it a well-practised dish in Spain but that the shockingly pinky-red dish I had eaten was merely a more traditional gazpacho with watermelon added. Far from the simple, distinct flavour I had experienced. 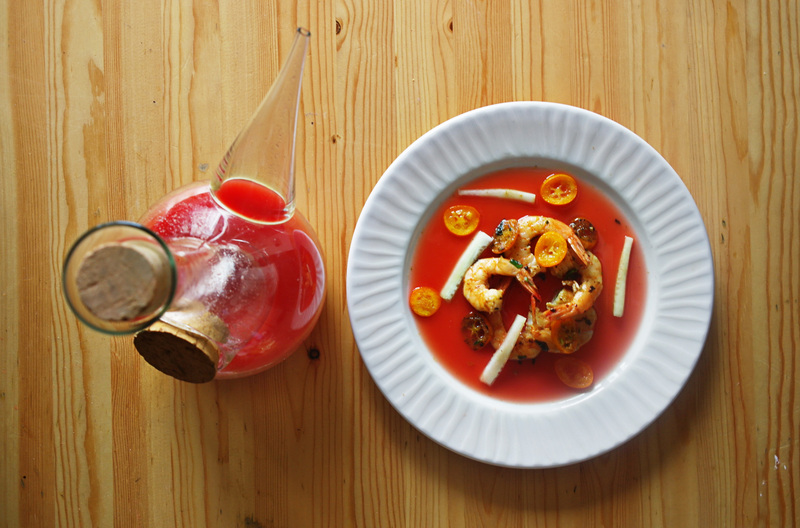 So I decided to create my own stripped back watermelon gazpacho. I was so happy with how it came out, such vibrant colours and flavours yet so easy to make, it honestly won’t take you more than half an hour to prep and cook; plus some chill time in the fridge in-between. There can’t be a better place to eat this than sitting outside on a sun-soaked evening with the BBQ burning. It was also a great excuse to utilise my latest flea market purchase: a decanter with ice-compartment. Process the watermelon flesh with the tomato in a blender until smooth, add the vodka and season to taste. The pepper really added something to the dish and worked well with the melon giving it a more aromatic fresh taste whilst the salt takes off the really sweet edge. Refrigerate for a minimum of two hours until ready to serve, then strain through a fine sieve into a jug. Peel the head, legs and shell from prawns, leaving the tail in tact (de-vein if you like – I didn’t) . Heads and shell can be set aside or frozen to make a good fish stock. 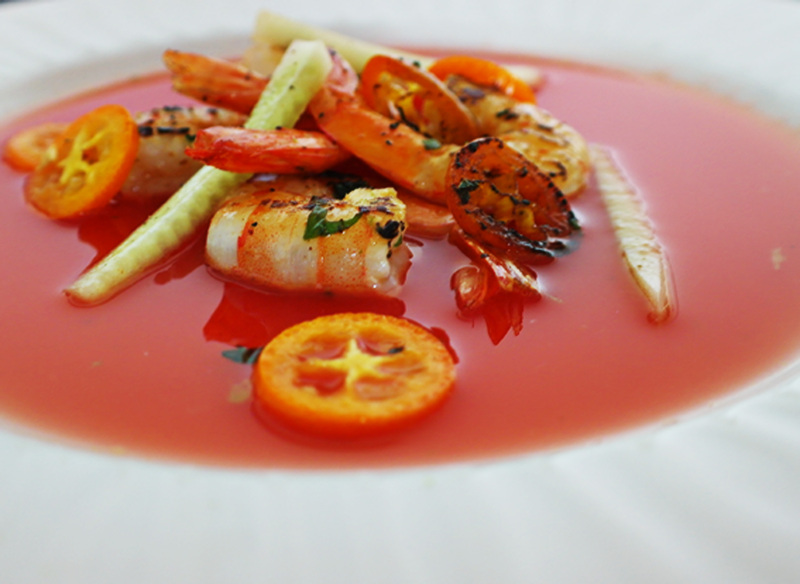 Add prawns to a bowl with the olive oil, parsley, kumquat slices, chilli and a pinch of salt. 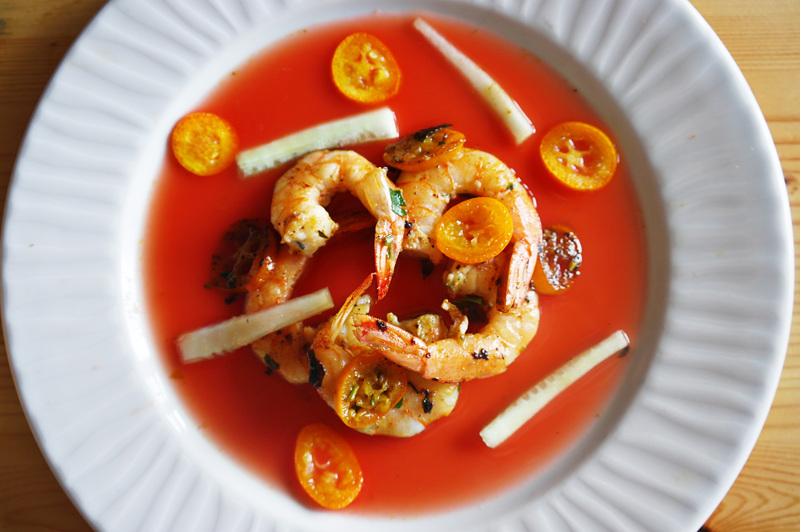 Leave covered in fridge to marinate for 15 minutes – we can’t leave this too long as the acidity from the kumquats could start to cook the prawns. In a pan: Heat some olive oil from the marinade on a high heat in a wide heavy-based pan until smoking then add half the prawns. They will need to be cooked just 1 minute each side if the pan is hot enough but cut into one to check before removing. Cook the remainder in the same way. On the BBQ: undoubtedly more flavourful and ‘smokiness ‘really works with the other flavours. Skewer prawns and kumquat slices from marinade and cook for 1 minute each side over hot coals. Absolutely beautiful, fresh & vibrant! Summer on a plate for sure. Looks amazing, presentation is perfect.